Week after week I come back to the one thing that makes Arrow such a great comics tie-in show: its willingness to embrace the lore from the source material and do some new things with it. Season 2 has really gone to town with it, what with Black Canary, League of Assassins, Barry Allen, ARGUS, Amanda Waller, Jean Loring, Bronze Tiger, Sebastian Blood, and many more new characters and organisations coming on to the show. Not to mention the continued existence of Slade Wilson aka Deathstroke the Terminator, who has been fantastically portrayed by Manu Bennett. But eventually, it all comes down to how all these characters and organisations are brought together, how they all relate to the overall story arc that is running through the season. And this is the part where Tremors works extremely well. For one, we finally have Roy and Oliver teaming up. Having Roy be injected with the mirakuru serum, same as Slade, opened up a lot of opportunities for the character to really go places and in this episode we saw how Oliver trains him to become someone who can control all the pent-up aggression and anger. These scenes reflect how Shado trained Oliver back on the island and they are a nice little callback to those days, tying together the events on the island even more firmly to what is happening right now in Starling City. It would have been quite easy for the writers to show a very predictable path for Roy, given his nature. But they do go the extra mile and show a somewhat different side to things. We see how Oliver is frustrated with Roy, how Roy is adamant about just going to punch things and how he needs to rise above his thuggish brawler tactics to look at the larger picture. This particular subplot was a bit cliched but it was executed well enough that I’m not really complaining. It was fun to watch all the way through, to see Roy’s internal angst come to the fore so prominently. On the other side of things, we have Michael Jai White’s Ben Turner aka Bronze Tiger broken out of Iron Heights prison to do a job by somewhat of a mysterious man. The opening of that subplot is particularly graphic, and shows how the writers and the director are not afraid to go a bit out there occasionally to show the darker side of life in Starling. An occasional thing like this is also evidence how Arrow is a thematic cross between Smallville and the Nolan Batman films, in terms of the graphic violence depicted on either (particularly with The Dark Knight and the Joker). White’s acting is good, but the thing is that he doesn’t have a lot of material to work with. I would have preferred to have seen Bronze Tiger get an episode of his own where he is the main antagonist rather than a big cog in a small wheel. Still, it is nice to see the character return. The fight sequences with Oliver are decent as well and I love to see these two go against each other, especially since the villain is always able to cut Oliver’s arrows in mid-air and provides a serious challenge to him since Oliver always has to get up close and personal with him. Range reliance just doesn’t work. And then, we had a really surprise angle in this episode where Moira Queen is concerned. This season’s Queen vs State is an episode with the lowest ratings of the season, and it showed Moira’s court trial and eventual acquittal for her role in Malcolm Merlyn’s conspiracy to destroy the Glades, which happened in the season 1 finale. Now that she has been acquitted and some time has passed since, and since Sebastian Blood is really gunning for the role of Starling’s Mayor, some of the wealthier individuals of the city are having huge doubts about the future of the city. And so, Moira’s estranged husband Walter and an acquaintance of his turn to Moira for help: they want her to stand in the elections for Starling’s Mayor against Blood, who has risen on the goodwill of the people and the promise of rebuilding the city. It is a really interesting angle and I loved that the episode showed how Moira herself had some serious doubts about the whole thing. After all, as a result of her actions the previous year, more than five hundred people died and the wounds are still raw for characters like Roy who lost several friends in the earthquake, and no less for Oliver and Laurel since they lost Tommy. It remains to be seen exactly how things progress on this front, but I have to say that I have very high expectations of this subplot and that I’m going to be very critical of it, most likely. It is a bold move for the writers and I want to see the execution. And there better be an episode where we see Sebastian Blood and Moira confront each other in a debate or something, where they both put forward their views and their differences. If there’s one thing that I didn’t immediately like with this angle though, is the conclusion of it in the episode. That makes me have some doubts about where Moira and Walter’s characters are headed, and I would love to be wrong on that one. Moira particularly has received a lot of positive development this season and I don’t want to see it stripped away. And finally, we have Laurel’s current arc. DUI, alcoholism, and now drug-use. Her life is just spiralling out of control right now. It is a shame to see that Laurel has received very little in the way of positive development thus far in the show, and that she is most often the damsel in distress. Things are kind of looking up for her right now, writing-wise, but I’m still in two minds with it. I want her to stop complaining all the time with her “woe is me” shtick and so something positive for a change. She refuses all help and she’s just closing herself off. Like her father did last season and like Oliver did after Tommy’s death. I think a big upswing is imminent for her. I mean, I want it to happen. The way that her subplot is concluded in this episode, and the way that things are looking to happen in next week’s episode, Heir of the Demon which will introduce Ra’s al Ghul’s daughter Nyssa, I am hopeful. But, that is not all! Because of course there is the great island sequence, brief as it is. Last episode, we saw that Slade had taken off by himself at night and that Oliver and Sara were about to go find him. Well, they do find him in this episode but they also learn how he plans to get his revenge on Ivo for Shado’s murder. And it’s not pretty. And it ties into the villain Fyers from last season. Explosive mix. That’s all I’ll tell you. What I loved about this bit was the relationship between Oliver and Slade. They are friends. They loved the same woman. But Shado ultimately chose Slade. And with Slade on the mirakuru serum, things are bleak for him, but it is nice to see that there is some redemption for him, even if it appears that there is none for Oliver. Or that could be backwards, depending on how you look at it, and what we saw in the season 2 mid-season finale. The episode wraps things up by bringing in Amanda Waller again. No points for guessing what she does here. My only hint: BT/SS. Make of that what you will. I am so damn excited now to see where her arc is going. Amanda Waller is one of my favourite characters from the DC-verse and I love that she’s been brought in for this season, and the (very) slow build-up of what she’s doing in Starling. Oh and we also see Sara’s return to the show in the present timeline, setting up for next week’s episode which is going to be fantastic I’m sure, if the trailer is anything to go on. Overall, this was a really fun episode. Its sets up a lot of new things for the various characters, and it really causes an earthquake for some, figuratively speaking, particularly for Roy who makes the “big jump” forward in his training. One word: Arrow-cave. 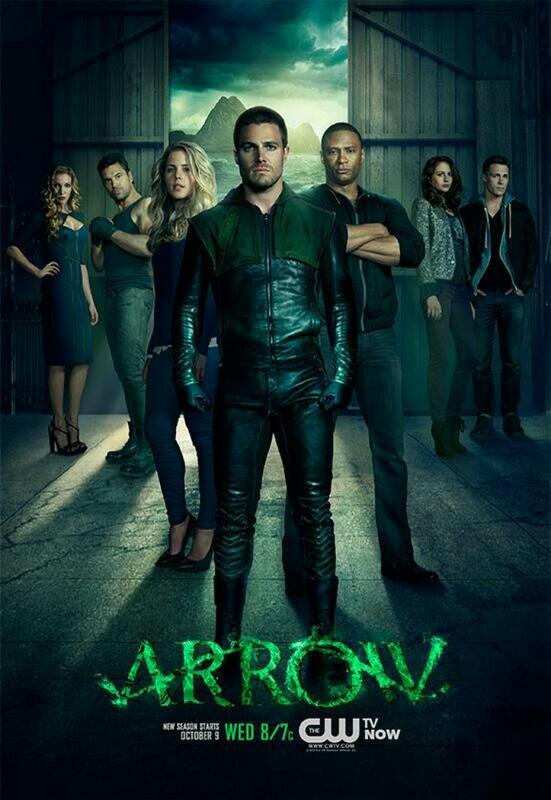 More Arrow: Reviews of all the second season episodes can be found here. Posted on January 31, 2014, in Arrow, Review Central, TV Show Reviews and tagged Amanda Waller, Arrow, Bronze Tiger, Caity Lotz, Colton Haynes, CW, David Ramsey, DC Comics, Deathstroke, Emily Bett Rickards, Explosives, Felicity Smoak, Green Arrow, John Diggle, Katie Cassidy, Manu Bennett, Oliver Queen, Red Arrow, Review Central, Roy Harper, Sara Lance, Slade Wilson, Speedy, Starling City, Stephen Amell, Suicide Squad, Superheroes, Supervillains, The Arrow, Tremors, TV Show, TV Show Review, Vigilante. Bookmark the permalink. Leave a comment.